Scott and I had gone through several ideas for our kitchen and changed our minds every day, it seemed. But then we (I thought) decided on a plan of action. One night Scott was there working while I played Volleyball. He got a little over-ambitious and took out our nice big pantry cupboard that was supposed to be staying. 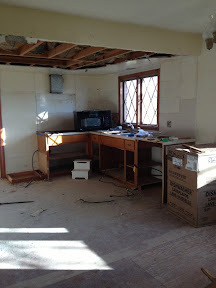 This is what our kitchen used to look. Not a humongous deal. But more money spent on an already tight budget to replace the cupboard. I am actually debating trying to build some of the cabinets ourselves. It may take longer but will help out our budget. 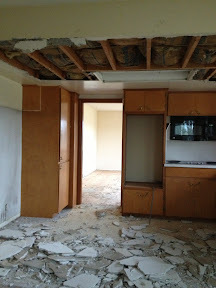 Our goal in the next couple of days is to get the remaining plaster down from the kitchen ceiling. And then to get the wood framework down. 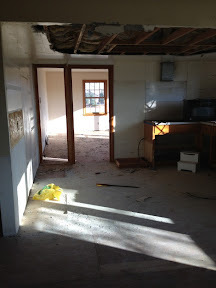 After that we will finally be done with demo!